I’ve talked before about the fact I don’t particularly care for liver and ways that I have tried to sneak liver into my own food so that I can’t taste it. It would be fantastic if the world’s most nutrient dense food tasted like Reese’s peanut butter cups, but unfortunately it just isn’t so. I really liked the idea of making frozen raw liver “pills”, but in practice I found that they were fiddly and often froze with sharp edges so I couldn’t get them down quickly and I would still taste the liver. I knew that I could buy desiccated liver pills from different supplement companies, but they were expensive, especially the ones that were good quality, i.e. organic and grass fed, and many of them had fillers such as maltodextrin (what), which is derived from corn (yep). 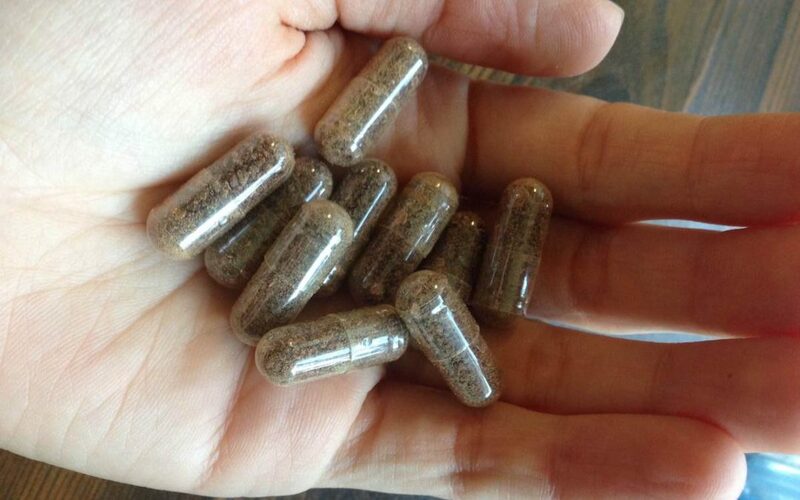 I wondered if it would be possible to make my own liver pills from local organic grass fed beef liver and gelatin capsules. I stumbled upon this blog post and was so excited to find that someone else had successfully done it and that it was a possibility! I found some high-quality, grass fed organic beef liver from Neiffer Ranch, which I can highly recommend if you have access to their products here in Eastern Washington State. So, let’s jump to it! Here’s how I did my last batch. You can halve the batch if you only have one dehydrator, but I really recommend doing a massive amount at once so you have enough pills to last you a while. Like I said, it’s not hard, but it takes time! 1. Cut parchment paper to fit the trays of the dehydrator. I just used pencil to trace the outer and inner circles of the dehydrator and then cut out the circle with scissors. 2. Purée the liver. I worked in batches, doing about 1/2 pound at a time. 3. Pour the liver onto the parchment paper- covered trays, about a quarter inch thick. You may have to use a spatula to spread it out evenly. 4. Cover the dehydrators with the lids. Set the dehydrator to 105°F if it has a temperature setting; otherwise, a low setting will work. You just want to keep it under 115°F so it stays technically ‘raw’ and therefore retains as much of its nutritional goodness as possible. Place the dehydrators in a well ventilated area. I am not going to lie; this does not smell fantastic. 5. When the liver breaks apart very easily with your hands, it is ready. If it just cracks or it tears, it needs more time. This will take about 24 to 72 hours, depending on how thick the sheets of liver are. 6. Break the sheets of liver apart into chunks small enough to fit in your blender. Blend the liver until it becomes a powder. You will likely still have small chunks of liver, so what I did was use a small strainer to strain out the bigger bits, collect the powder in a bowl, and put the bits back into the blender to be ground again. This part will take a while. 7. Once you have your powder, get your encapsulating machine and your gelatin capsules. Fill up the machine with capsules. Use a spoon to drop a couple heaping tablespoons of liver powder into the capsules, and to use a card to push the powder into the capsules. Put the lids on the capsules, pour the finished capsules into a mason jar, and store the mason jar in the freezer. Even though the powder is dehydrated, I keep my liver pills in the freezer just in case. If this seems like way too much work for you but you still want to get liver in your diet, check out my ‘I can’t believe it’s liver’ meat patties, or just try mixing ground liver with ground beef in a 1 to 4 ratio. If you end up making the liver pills, let me know what you thought! If you have other hidden liver recipes you love, leave them in the comments section below, or post them on Instagram and tag me (@rosemaryfotheringham) in it; I’m always willing to try new recipes! And as always, feel free to leave any questions in the comments or by emailing me. Wow woman ! You are amazing! On my to do list!